Kenneth J. Arrow is Joan Kenney Professor of Economics and Professor of Operations Research, Emeritus at Stanford University. Kristen Renwick Monroe is Chancellor's Professor of Political Science at the University of California, Irvine. Nicholas Monroe Lampros is an Associate at Covington & Burling LLP. For over sixty years this restless analyst has produced works of astounding importance in a variety of subjects.… Both brains and heart are immensely important in explaining Arrow's far-reaching productivity. Certainly, Arrow's extraordinary analytical power and penetrating insights have given him the capability to be so comprehensively productive. But, in addition, his dedication to clarifying the impact and implications of human decisions and their interactions, which can make a gigantic difference to the richness and poverty of human lives, has clearly been a constant motivation for Kenneth J. Arrow. No one has done more than Kenneth Arrow to define what economic theory is today. His story is central to the modern history of economic thought. In this beautiful book, he has given a unique personal perspective on this great work which will be valued for ages to come. Kenneth Arrow changed my life when, as a math major in college, I wandered into his course in the economics of information. The course showed me how economics can use mathematics and other technical tools to study important issues. He won me over and I ended up doing a PhD with him. This book should give readers some idea of why he was so persuasive. These interviews are a true delight to read, reminding us of Arrow's clear-headed intelligence, marvelous good sense, and how his broad views emerge from his pleasure in systematizing guided by ethical concern. Arrow provides cogent, common-sensical explanations of how economies work… and has a keen eye for what we don't grasp about economies, such as the role of non-market social networks and relations. Can you imagine having a conversation with one of the foremost social and economic thinkers in the world? Imagine no more. 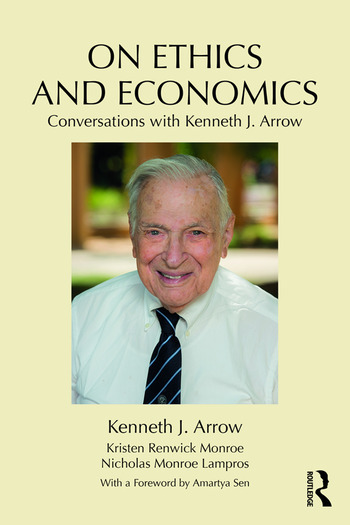 In this lively and engaging book, Kenneth J. Arrow—who continues to be productive well into his nineties—continues to enlighten us about the market economy, democracy, politics, social choice, and ethics. Few have done more to illuminate these fields, show how they're intimately connected, and why the connections are so important to understand. We are indebted to Kristen Monroe for a charming interview on ethics and economics with one of the great economists of our era. I enjoyed it thoroughly and am sure you will too.